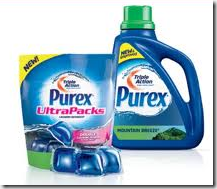 Free Purex Crystals with Purex Ultra Packs purchase for $3.99 at Target! Target is having a sale right now when you buy Purex Ultra Packs, you will get Purex Crystals for free. 2.When you buy 1, Receive Purex Crystals, 28 oz Free. 3.Use $1.00/1 Purex Ultra from Peelie on package. 4.Final Price for this item $3.99 + Free Purex Crystals! Multipurpose Paper Free at Stables! Van’s Waffles only $0.33 at Target with High Value Coupon!